Sailing was one of my dad's favorite activities. He orchestrated sailing trips to Traverse Bay in Michigan, The US and UK Virgin Islands, the Gulf coast of Alabama, and trips to sail along the North Carolina Coast. Additional he and my mom would sail on a regular basis when they lived in Southern California. 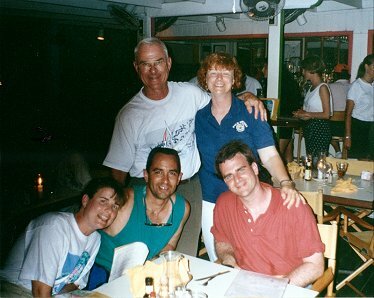 Here's a picture from a sailing adventure in the Virgin Islands in 1994. In the picture to the left, the people (from left to right, back to front) are my dad, my mom, Nancy, Pete and myself. This was taken on St. John, USVI. One of the places that we stayed was the Bitter End Yacht Club. This is Norm Groves, my dad, at the helm of a sailboat owned by Robert Miller. This picture was taken off of the North Carolina coast just north of South Carolina.